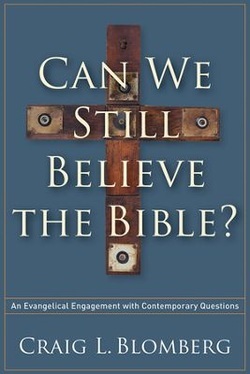 Subtitled “An Evangelical Engagement with Contemporary Questions,” this book presents arguments for the Bible's reliability in response to some of the extremely negative or excessively literal views about Scripture which may be found in contemporary culture. The author, who is Distinguished Professor of New Testament at Denver Seminary, has written a book aimed not so much to refute sceptics as to guide believers into a balanced understanding and viewpoint of what the questions are and how we can best approach them. Blomberg makes the point that we find two extremes – ranging from that of religious hardliners demanding unwavering concurrence at one end of the spectrum to unbelieving individuals who try to destroy the faith of believers at the other – and that both extremes are wrong. Rather, the author shows, we can find a balance in which questions are not only fairly evaluated, but also settled in faith. The six chapters of the book look at a range of questions which might fairly be asked about the Bible if we are to accept its authority in our lives. In the first three chapters Blomberg looks at issues regarding the trustworthiness of the biblical text as we have it today. Chapter 1 asks if we have the actual words of the Bible or not. In other words, has the biblical text become corrupted over time, as is sometimes claimed? Chapter 2 looks at the process of canonization of the Bible – was this a random chain of events stirred mainly by political and theological concerns in the early church or was the process guided by a clear desire to establish authenticity. Some readers will be disappointed in Blomberg’s rejection of the deuterocanonical or apocryphal books with arguments of varying degrees of strength, yet his position is nevertheless a considered one. Chapter 3 looks at the reliability of modern Bible translations and so rounds out the author's discussion of whether we can trust the text we have to say what it was intended to say. In the second half of the book, Blomberg turns to the deeper inherent questions of the content of scripture and whether we can rationally believe in the inerrancy of what is written. In Chapter 4 he takes the position of the majority of Christians throughout history in affirming the Bible’s complete trustworthiness as a collection of God-breathed literature. But he does not think that belief in the Bible’s inerrancy commits one to a literalist reading of every part of it. His position is clarified in the final two chapters which look at specific cases. Chapter 5 asks: “Aren’t Several Narrative Genres of the Bible Unhistorical?” and gives a guarded but positive discussion of biblical historicity and inerrancy. While it is easy to see that many parables – for example the story of the Good Samaritan – are not intended to be viewed as based on an historical event, narratives such as those found in Job or Isaiah are not all so easily understood in terms of their origin or historical basis. Are we to believe that Job spoke with his friends completely in poetic form or is this a literary retelling of a story rooted in historical fact? Blomberg allows for the fact that some biblical genres may reflect historical events seen through a literary lens, but stresses that even so their message remains intact, and that this does not affect any understanding of biblical inspiration or inerrancy. Doubtless there will be individual acceptance or rejection of some of the specific examples Blomberg gives, but his stress that not everything is clear in Scripture and there must be room for respectful ongoing dialogue in individual cases is sound. Chapter 6, “Don’t All the Miracles Make the Bible Mythical?,” is an interesting treatment of the idea, held by so many today, that the miracles recorded in the Bible are merely myths and legends. Blomberg looks at the differences between the approaches of ancient and modern historians and concludes that, while the Biblical narratives may not be in the form sought by modern science and philosophy, they nevertheless give us information which we really have no reason to doubt given an open assessment of the biblical record and the circumstances surrounding it. Overall, Can We Still Believe the Bible? provides a thoughtful and nuanced discussion of questions which both sceptics and Christians might ask. Some Christians will doubtless be unhappy with some of the answers Blomberg gives, but Abraham Lincoln covered that situation in what he said about pleasing all the people all of the time. I personally think that for most Christians Blomberg’s book will be a refreshing look at real questions that affect personal faith, and it also provides a number of very good answers along the way.